This week, we are counting the albatross chicks on the entire island before they fledge! I will let you guess our final count. Stay tuned next week when we release our final counts! A few weeks ago, we welcomed Nimz and David, monk seal technicians. They will stay on the island until mid-August, during the pupping season. They came with the SETTE, an NOAA ship that prospect the Northwestern Hawaiian Islands for potential young Hawaiian Monk seals candidates to send to rehabilitation if in poor body condition. The seals are then placed in a “seal hospital” called Ke Kai Ola, located in Kona, Hawaii. New faces, chain of buckets and totes and water jugs and wheel barrels, reminded us that not too long ago, it was us! With them, Leleaka, a yearling female seal came back home after half a year of rehabilitation, now sized as a three-year-old. She was staying in a cage for 3 days before we finally released her to the ocean. That moment was very powerful for each of us. She looked back several times to her cage before taking off, rediscovering the nature of the ocean, swimming freely! Nimz and David are conducting daily surveys of the whole island documenting the seal population. Their mission is also to tag the newly weaned seals and vaccinate identified seals. We are trained to assist them if needed. The vaccinations are a preventative measure to buffer the population against the threat of canine distemper, a morbillivirus that has impacted similar seal/sea lion species in other parts of the world. In the Northwestern Hawaiian Islands, the endangered Hawaiian Monk seals are threatened by marine debris, shark activity, overfishing, loss of habitat and male aggression within the species. Currently, the population is rising, with estimates at around 1400 Hawaiian monk seals. Approximately 30 percent of the population is alive today due to efforts by seal technicians (including the DLNR field teams on Kure) providing veterinary and disentanglement assistance. As the ship came, our Tiki had to return to Honolulu to continue her efforts in the Oahu Offshore Island program and so our field team was reduced to five people. Tiki, thank you for everything! “You can leave Kure, but Kure will never leave you” (A quote from the USCG Monument on Kure). We are getting very close to finishing a full treatment of the island. Over the past few weeks, the temperature has risen significantly, approaching 80ish degrees. Summer is around the corner! A 15ish mph East wind provided us some nice breezes while working in the open fields and dense naupaka. The east wind is also a treat for the albatross chicks, as they are getting ready to fledge. They have now few downy feathers that remain on their head and on the sides of their bodies-parts not readily accessible by their bill. While treating one area, we spotted the first Black-footed albatross chicks that were almost fully feathered and looked like adults. Whenever a wind gust comes by, you can be sure to watch a parade of wings and hops here and there. Thinking that two months ago, when we first arrived on the island, they were all downy! The growing stage goes even faster for the smaller birds. The white tern chick that is living close to the nursery flew for the first time last week. His mum is still feeding him, and he still sticks around. 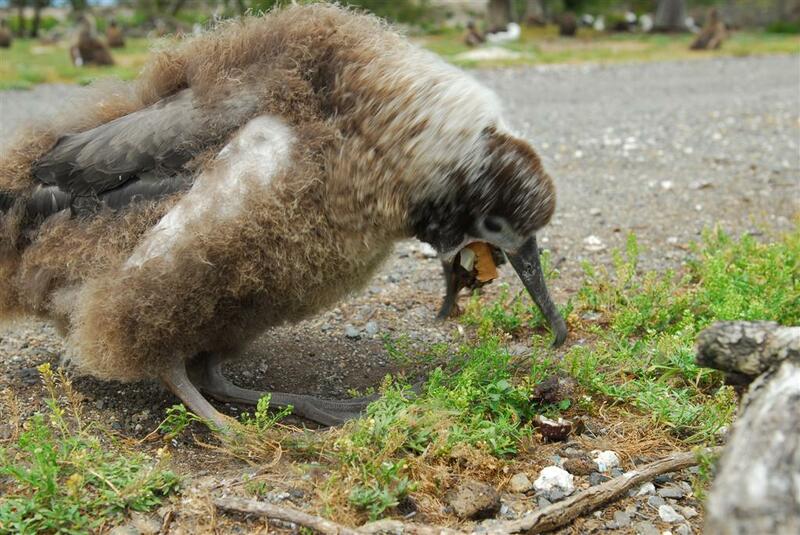 There has been a die-off of the albatross chicks over the past few days and the island has a smell for it. Hit by heat stress and fewer parents coming back to the island to feed them. A dead bird disappeared in a matter of few days here, offering food for creatures and plants. We collect albatross boluses for research and educational purposes. A bolus is non-digested bits of food, almost always bits of plastic. As a side note, when an adult is feeding a chick, the food is its only intake in a period of up to 2 weeks! Boluses have often an oblong shape. You know when they are about to regurgitate one, they make a very high-pitched noise, extend their neck up and down and shake their head frenetically. It looks very painful and can take several hours. Boluses are usually black, from the color of the squid beaks and oil. Each of them tells you a story. You find exciting and sad things, from bits of plastic to the very prized sea beans. Plastic is common to be found in all shapes, sizes, and colors. For instance, we saw fragments of plastic bags, plastic cups, little figurines (a Buddha! ), lighters, toothbrushes, rope, a 10inch black tube and so on.